Bapco decided to construct a grass root plant to produce 400,000 MTPA of very high viscosity index (VHVI) Group III Base Oils. Samsung Engineering and Company Limited (SECL) was the EPC Contractor for this project and MCSC was the General Contractor for civil, mechanical and piping activities. The Plant consists of the following process units. 12,000 BPSD Feed Preparation Section. The project also included the following supporting utilities and off-site facilities. Eight 67,500 barrel product storage tanks. Four Shipping Pumps with 1320 gpm. Three 12” dedicated shipping lines. Other utility piping and system interconnections. Hot tap tie-ins to LSDP existing plant. The US $314 million LBOP project is one of the largest Lube Base Oil Plants. This project was declared the winner of the 2012 MEED Quality Awards for projects for its economic, social and environmental impact, innovations and achievements in design, engineering, and construction. It was recognized as a project which produces initiatives that recognize best practices in the project construction sector. MCSC was honored to have played a key role in the development of Bahrain with support from SECL, Bapco and partners, and were able to execute the project on time and achieve the total project safety milestone of 10 million man hours without lost time incident. 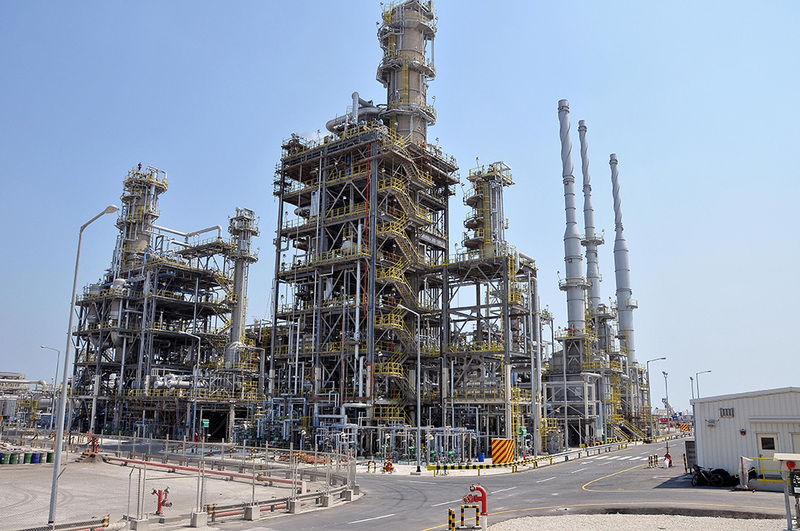 The opening of the Lube plant provided a fresh impetus to business investments in Bahrain and set new benchmarks for use of technology in the oil and gas industry. This also helped in local employment on a larger scale and opened new markets for Bahraini products. Construction Duration: March 2009 – February 2012 (36 Months). Man Hours: 3,972,266 Hrs (Without LTA). Manual Excavation in Brown Field: 4,350 Cu.M. Total Structural Steel Fabricated and Erected:1,142 Tons. Total Handrails & Ladders: 5112 LM. Piping Fabrication &Welding: 305,000 Inch Dia. Total PWHT done: 3,785 Joints. Total HT done: 8,471 Joints. Total PMI done: 5,480 Joints. Total FT done: 1,177 Joints. Total Hydro test: 1,513 Packs. Total Equipment Tonnage: 2,433 Tons. Total Painting Completed: 33,296.49 m.
Subsea Lines 03 Nos. Dia. 12”: 10,931 Mtr.